Do you want to trade some native plants or would you like to find a place to take the invasive plants you don’t want in your yard or garden? Come to the 2017 Texas Most Wanted Invasive Plant Buy-Back & Native Plant Swap on March 25 from 10 am-12 pm at Village at Western Oaks Karst Preserve at 5301 Davis Lane. If you would like the plant list along with more information or are interested in volunteering, send us an email, and we’ll connect you with the person in charge. Join us for a community-wide BBQ and potluck on Saturday, June 25 from 11:00 to 1:00. We’ll provide a couple of grills (one specifically for non-meat items), water, and iced tea. We’ll also cook up some sausage. You bring a side dish, any non-meat main course you may want, and adult beverages, if you like. Be sure to bring something to sit on, too. We’re opening this event up to the community at large. Please let all your friends and neighbors know everyone is welcome to this event. Please visit our Facebook Event page (you don’t have to be on Facebook to do this) and RSVP by either clicking on Interested, Going, or Not Going on the drop-down menu. The recipient of our giving back to the community this month is Austin Pets Alive! In that spirit, we welcome all well-behaved pets on leashes at the social. The following is an abbreviated wish list from APA. You can see the full list here. Please consider bringing one or more item from their wish list. Thanks to everyone who came to the monthly social in the garden last Saturday. We had quite an assortment of cookies–even a few vegan varieties. Congratulations to our winners: Sharon (3rd), Chelsea (2nd), and Gordon (1st). Be sure to check out the photos of our social in the photo gallery under Sharing the Love Valentine Cookie Contest. We look forward to seeing you all next month for the Easter egg hunt on March 26. We are opening March’s monthly social up to the entire neighborhood, so be sure to spread the word. This month’s members-only social in the garden will celebrate Valentine’s Day on Saturday, February 13, at 2:00 with a Valentine cookie contest. Make and bring your favorite Valentine cookies to share. Everyone in attendance will get a ballot to vote for their favorite cookie. The first place winner will receive a garden gift basket and the runners-up will receive prizes, too. Winners will be announced at 3:30. In keeping with our tradition of giving back to the community, we will be holding a donation drive to benefit SafePlace. SafePlace provides emergency and support services to families escaping domestic or sexual violence. To learn more about what they do, visit their website at http://www.safeaustin.org/safeplace/. Be on the lookout for a few new beds in the garden. We’ll be getting some asparagus, sunchoke, and artichoke beds soon. Under the pavilion, there’s a community tray where you can share any excess seeds, plants, etc. Please feel free to add any extras you have or take something from the tray you may be able to use. During our meeting yesterday, we discussed the Ground to Ground project. Click the link if you’d like to learn more. Look for a few new events happening in the garden as well as a few tweaks to the website. We’ll keep you posted! Please join us for a hot chocolate social to celebrate as we head into the holidays. We’ll provide the hot chocolate (both regular and dairy-free). You bring a mug from which to enjoy your hot chocolate and a chair, if you don’t want to stand. Also, if you love to bake, please feel free to bring your favorite holiday cookies. Our community service project this month is a toy drive for Operation Blue Santa. If you are unfamiliar with this program, Operation Blue Santa is a non-profit organized by Austin Police Department that provides a holiday meal and toys for each of the children in pre-selected families in need. Please bring a new, unwrapped toy appropriate for a child up to age 14. We look forward to sharing a mug of hot chocolate and holiday cheer with you all! Cherry Creek Community Garden members are invited to join together for a fall potluck in the garden this Saturday, November 21, from 12:30 to 2:30. Central Market has given us a donation, which we will be using to purchase turkey and ham for the dinner. We’re creating a sign-up sheet for your contributions to the potluck and will send it out soon. We will serve the potluck off the beautiful community table, so be sure to include a serving utensil with your dish and bring a chair or blanket to sit on. In case of inclement weather, we’ll move the potluck to Frankie’s house. Keeping with our young tradition of giving back to the community, we ask attendees to consider bringing a donation of non-perishable food. At a time when we gather to give thanks for all we have, we ask you to remember those who are struggling to put food on their families’ tables. We will deliver all donations of non-perishable food to the Capital Area Food Bank of Texas. This beneficial spider is also known as a yellow garden spider or an orb weaver. Its webs are very intricate and can be over two feet wide. 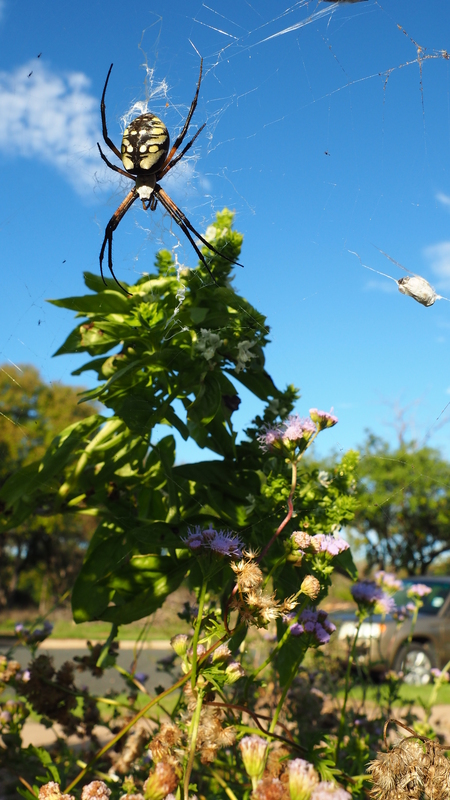 This spider, while it looks large and frightening, is a friend to the garden. Its prey includes mosquitoes, flies, moths, and some wasps. This one was spotted in the herb spiral, so if you are visiting the garden, enjoy checking her out, but please don’t kill her. Members, join us for our workday on Sunday, October 18 from 2:00 to 4:00. Please note we’ve switched our workdays to Sunday afternoons in anticipation of cooler weather. We are opening up the monthly social to the Central Cherry Creek neighborhood this month with our Goblins in the Garden event. Bring the entire family to the garden for an early Halloween celebration. There will be pumpkin decorating, face painting, and snacks. We’re working on the possibility of a hay ride around Bayton Loop, too. Feel free to come in costume! We are also beginning a tradition of using the monthly socials as a way to give back to the community. This month, we’re taking up a collection of new, adult-sized socks. We will distribute these to the homeless people in our area when the weather turns a little colder. We hope to see you in the garden soon!